​"If I have to parallel park, don't invite me." Parallel parking is likely the most-dreaded part of the driver's license road test. 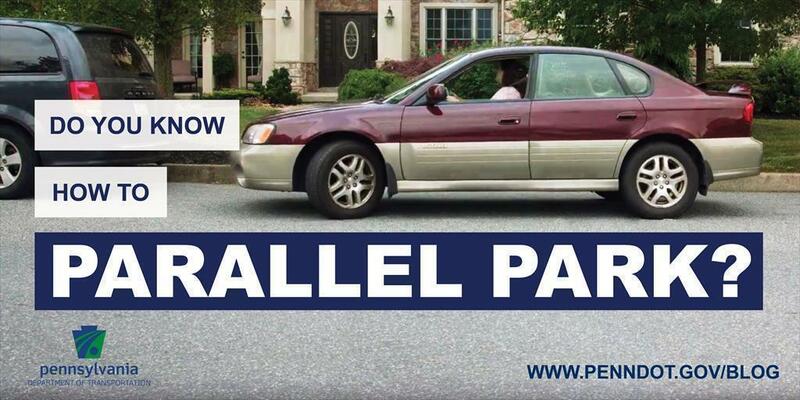 It can be intimidating for sure, but with some helpful tips and lots of practice, you can be a parallel parking pro. Go up onto or over the curb. You have just one attempt to successfully park your vehicle using no more than three adjustments. Stop even with the vehicle ahead and allow 2 feet between it and the passenger side of your vehicle. Turn the steering wheel sharply to the right and back slowly toward the vehicle behind. As your front door passes the back bumper of the vehicle ahead, quickly straighten the wheels and continue to back straight. When your vehicle is completely clear of the vehicle ahead, turn the wheels sharply to the left and back slowly to the vehicle behind. Turn wheels sharply to the right and pull toward the center of the parking space. Learning drivers can practice parallel parking at home by setting up their own cones or other obstacles. You may also practice at your nearest PennDOT Driver License Center during non-operating hours. Use our locator service to find a PennDOT location near you. For more driving information, be sure to read the Pennsylvania Driver's Manual (PDF), listen to the audio version, or download our driver's license practice test app. Also, check out the steps to getting your license in Pennsylvania. Ready to take the test? Schedule your skills test online or give us a call to schedule.